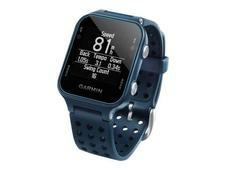 Garmin Approach S20 Gps Watch Unit - Midnight Teal (30,000 Courses Downloaded Free) - $199.99 - GolfersEdgeOnline.com - Best Golf Equipment On The Web! AutoShot Round Analyzer: On the course, the Approach S20's AutoShot round analyzer² tracks shots4, measures distance and auto-records shot locations for post-round analysis on Garmin Connect. Garmin Connect Golf Community: Garmin Connect is the online golf community that lets you play, then share and compare. Download your round and contrast it to your last round; track improvements to your game for every course you play. The Garmin Connect golf community can even assemble your ideal round, combining your best score for each hole to get your ideal 18 for that course. Green View Display: The Green View feature on your Approach S20 shows you the true shape and layout of the green, even if you're behind it. You can manually reposition the pin to today's location for accurate shot selection. Keep a Digital Scorecard: Approach S20 golf watch easily keeps track of your score throughout your round. When you're done, you can save, review and even use the Garmin Connect Mobile fitness app with your smartphone to upload and share that great round with your golfing buddies online. Smartphone Notifications: Never miss another important text, email or alert just because your smartphone is tucked away somewhere in your bag. Approach S20 acts as a wireless extension of your compatible smart device, displaying smart notifications, right on your watch³. Now, via Bluetooth® technology, you can read that email or text you've been waiting for - even in the middle of the fairway. Extra-long Battery Life: Your Approach S20 features a long-running lithium-ion battery to carry you through long rounds or those extra holes. You can easily get in a whole weekend of golf with up to 15 hours in full GPS mode before the battery needs to be recharged. For daily use in activity tracking mode, you can expect the battery to go up to 8 weeks between recharges. If you have any more questions about the Garmin Approach S20 Gps Watch Unit - Midnight Teal (30,000 Courses Downloaded Free); do not see the model you are looking for; need custom options; or prefer to not purchase online, then please call us at (630) 656-1291.